Documents of the WCC 10th Assembly are available on the World Council of Churches website. A number of documents were sent out before the Assembly to prepare the delegates and visitors for the Assembly. You will find them here. Report of the Finance Committee of the WCC 10th Assembly. 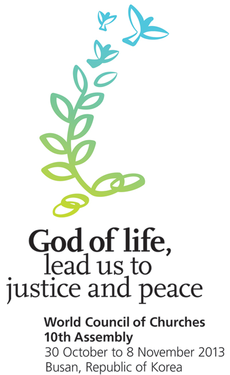 This Unity Statement was adopted by the WCC 10th Assembly on 8 November 2013. It is based on a draft statement on Christian unity presented in 2012 to the WCC Central Committee. Report of the Programme Guidelines Committee, adopted by the WCC 10th Assembly. The Statement on the Way of Just Peace was adopted by the WCC 10th Assembly as part of the Report of the Public Issues Committee. The Minute on the Situation in Democratic Republic of Congo was adopted by the WCC 10th Assembly as part of the Report of the Public Issues Committee. The Statement on Peace and Reunification of the Korean Peninsula was adopted by the WCC 10th Assembly as part of the Report of the Public Issues Committee. The Statement on the Current Critical Situation of Abyei in South Sudan was adopted by the WCC 10th Assembly as part of the Report of the Public Issues Committee. The Minute on Indigenous Peoples was adopted by the WCC 10th Assembly as part of the Report of the Public Issues Committee. The Minute on Climate Justice was adopted by the WCC 10th Assembly as part of the Report of the Public Issues Committee. The Resolution Urging Improved United States - Cuba Relations and Lifting of Economic Sanctions was adopted by the WCC 10th Assembly as part of the Report of the Public Issues Committee. The Statement affirming the Christian presence and witness in the Middle East was adopted by the WCC 10th Assembly as part of the Report of the Public Issues Committee. A large number of messages and greetings were received by the WCC 10th Assembly. You will find them on the WCC website. Speech by Michel Sidibé, Executive Director of UNAIDS delivered during the Theme Plenary at the WCC 10th Assembly. The title of the speech is "Churches: Barricades against exclusion"
Reflection by Bishop Duleep de Chickera from the Anglican Church of Sri Lanka, presented at the WCC 10th Assembly during the theme plenary. Address by Metropolitan Hilarion of Volokolamsk, Chairman of the Department for External Church Relations of the Moscow Patriarchate, at the General Assembly of the World Council of Churches. "Under the Power of the Holy Spirit" (John 4:17-31) - Sermon by Rev. BANG, Ji Il and "Justice Rising" by Rev. Dr Jennifer Leath. Evening Prayer by Protestant Church Women United. Sermon about Vision of Amos (Amos 5: 14-15, 21-24) by Rev. Kim, Soon Young, South Korea. The service of "Artoklasia" or "The breaking of the bread". Introduction by Ambrose Cho Song Am - Orthodox Metropolitan of Korea. Father Michael Lapsley, SSM, director of the Institute for Healing of Memories in Cape Town, South Africa, delivered this sermon at the sending prayer of the WCC 10th Assembly. A statement by the men of the first WCC Women’s and Men’s Pre-assembly to express their gratitude to women who enabled them to better understand the pain and injustice of patriarchy and gender inequality and commitment to stand in solidarity with movements for gender justice.